Nachdem Andy Kruspe sein erstes Buch abgeschlossen hatte, fiel ihm auf, dass es keine Methoden gab, nach denen gelehrt wird, wie traditionelle irische Musik begleitet werden kann. Um diese Lücke zu schließen, hat er "Playing the Tune" geschrieben. Mit Hilfe von Erklärungen, Notierungen und für das Buch aufgenommenen Beispielen werden in "Playing the Tune" viele Methoden aufgezeigt, wie man irische Musik begleiten kann. Eine CD mit Aufnahmen der tunes (nur Melodie), bodhrán Aufnahmen sowie Melodie zusammen mit bodhrán für jede dieser Methoden. 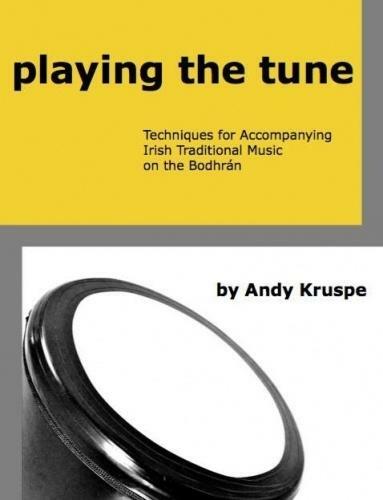 Andy Kruspe’s book Playing the Tune is a wonderful companion to his first resource The Bodhrán Primer. While his first book sheds light on bodhrán technique, this new resource focuses on what to play as you accompany other musicians. Playing the Tune is a logical, step-by-step approach that allows you to apply your technique to accompany traditional Irish melodies in a variety of styles and rhythmic settings. The notation is clear and the CD tracks are fun to play along with. I don’t think there are better resources to begin learning and/or supplement your studies of the bodhrán than what Andy Kruspe has created. Das Lehrbuch ist auf Englisch!